Roofs are a critical element to your home. Poor roof coverings, ventilation, soft sheeting or framing, exposed felt, tar patches flashings and valleys etc. are some of the items that we report on. 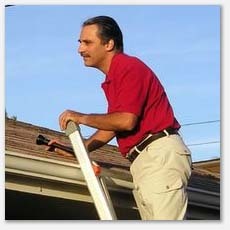 We further investigate attic and interior ceilings for stains or damage caused by roof problems. We estimate the age and lifespan of your roof to help you buy with confidence. Moisture in contact with wood can lead to damage by wood destroying organisms. See our sample roof report. See more roof problems here. This is a picture of a poor roof. We knew before we got into the house that we would find evidence of water damage, and we did. Click for a close up This is what the attic of this home looked like, this is one of the worst examples of water damage and bio growth in an attic we have ever seen. Click for a close up.